Intro to Aerial Sling meets on Fridays at 4pm beginning on 10/19. The fee for each 5 week session is $100. Class fees are due upon registration in order to reserve your spot in class. Due to limited class sizes, late cancel fees apply. If you are interested in private or semi private lessons, please email to inquire about rates and availability. If you’re interested in aerial silks but not sure if you’ve got the upper body strength, Sling is a great place to begin! No aerial experience is required, but good body awareness is a plus. We’ll learn lots of moves and transitions while getting comfortable with the fabric and building lots of core and upper body strength. Sling can help prepare you for silks, but it’s also a fun and challenging apparatus that students can then continue to explore with more advanced moves and choreography if they wish to continue! Limited spots are available, so register now! Brenda teaches Aerial Hoop (Lyra), Aerial Silks, and Aerial Sling at the Madison Circus Space. After beginning to teach yoga and aerial yoga in 2014, she became intrigued with the aerial arts, and now it’s hard to keep her feet on the ground. While Lyra is her primary apparatus, she loves flying on trapeze, sling, silks, and rope. 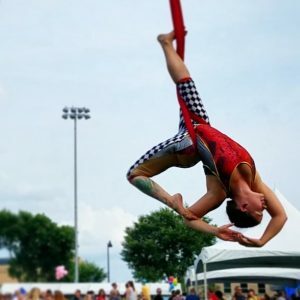 Brenda is a full-time movement instructor with extensive yoga training, Unnata aerial yoga and advanced aerial yoga training, aerial hoop teacher training levels 1 and 2 through Born to Fly, and teacher training on silks and trapeze through Nimble Arts. She loves to share her passion and help students on their journey to build strength, grace, flexibility, and confidence. Email her at blsmage@gmail.com for info on private and small group classes.